Whenever a tile featuring a hill icon is added to the playing area, it is placed on top of another randomly drawn tile, elevating it above the playing surface and creating a hill. Hill tiles act as tie-breakers: if two or more players occupy the same feature equally (a "shared majority"), but one of the tied players has a follower standing on a hill tile, that player will have an advantage over the others, and will score all the points for that feature. Vineyards are designed to increase the importance of monasteries. Each vineyard tile placed around a monastery adds three points to that monastery's score. However, these bonus points only count if the monastery is completed, so players are more likely to sabotage their opponents' monasteries in order to prevent them from being finished. Shepherds are new pieces that can only be placed in fields. Each time a player expands the field occupied by his or her shepherd, that player has two options: 1. Draw a sheep token out of a bag, placing it near their shepherd; or 2. Trade in all their accumulated sheep for points. Each sheep token is worth 1-4 points, depending on the number of sheep depicted. However, hidden among the sheep tokens are two wolf tokens, and if a player draws one of these, all of their sheep are lost and placed back into the bag. 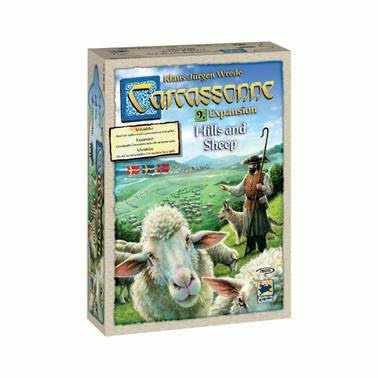 This introduces a push-your-luck aspect to Carcassonne, as players can choose to either "cash-in" the sheep they have, or try to add more sheep and risk losing them all. The goal of Hills & Sheep remains the same as in basic Carcassonne: claim the most points to win the game. Part of the Carcassonne series.